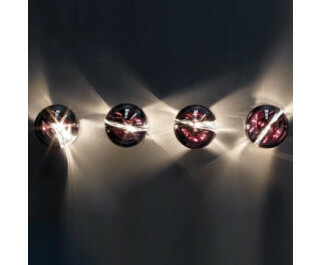 The Poc FA 16 wall or ceiling light by Vistosi has been designed by Barbara Maggiolo 2003. This design is a patented technique that entails crafting a hand-made sheath inside a shaped element of blown glass. This unique design will add beauty to any decor. This beautiful light was created on the island of Murano. Each light comes with a certificate of authenticity. The lamping is suitable for 1 x G9 40W halogen.